Make sure your surface is clean and tape off the area you want to paint. Spray it down and let it dry. Rub on your vinyl letters. I was able to purchase these from an Etsy shop for $2.00. It was my cousin-in-law’s shop so she sent me all different fonts and sizes too! 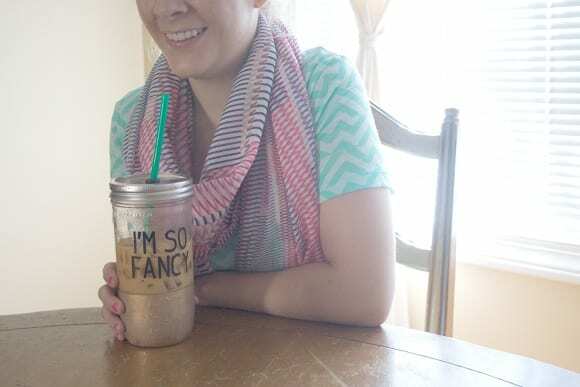 Her shop is currently on vacation but you can find other shops that offer just the vinyl lettering/phrases with out having to purchase them already on an item. 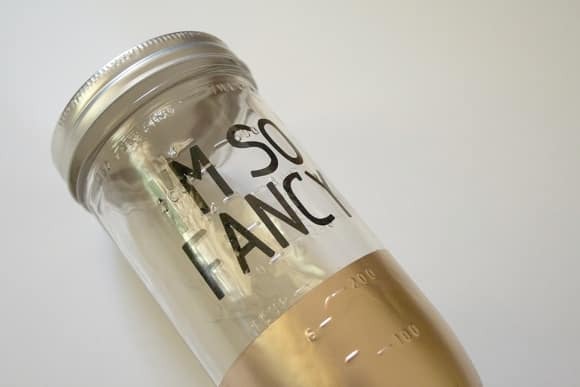 Be sure to rub on the vinyl throughly since the jar has a bumpy surface. 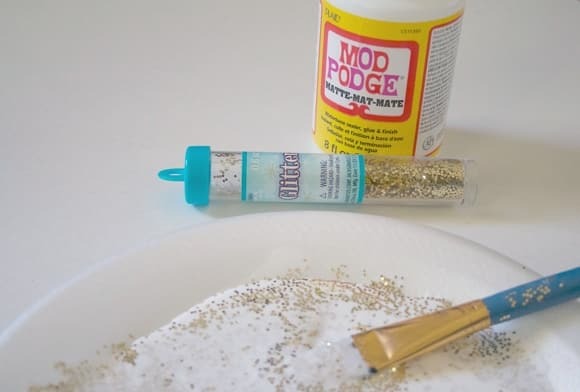 Mix the glitter with the Modge Podge and brush a generous amount over the spray paint. This will also help seal the paint. Let it dry and place the lid insert in the top. Make sure you look at what kind of top you have. 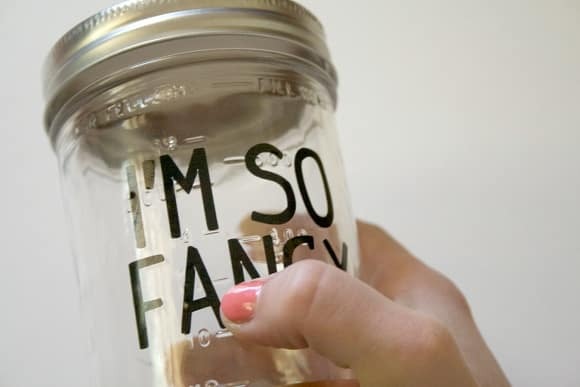 This is particular jar is a wide mouth and any regular sized mason jar accessories will not fit it. I found these jar inserts from an Etsy shop, 2 for $2.50 shipped! Perfect since I was making one for my best friend too! She also graciously agreed to model them for me! Washing/Care Instructions: Hand Wash ONLY! Also, when the drink you put in it is very cold or when you wash it, the Modge Podge will start to appear white again. Don’t worry, this goes away. 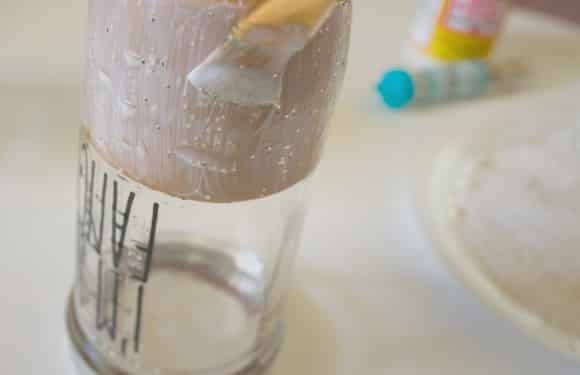 Spray Paint/Modge Podge/Glitter – Already had it, so FREE! 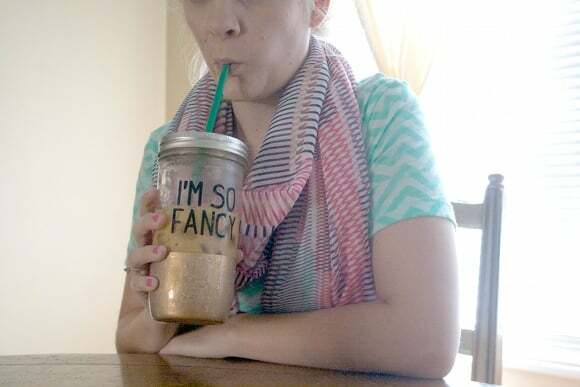 Total: $7.50 for two tumblers! Do you put anything over the vinyl lettering? I would think that with drinks that “sweat” they could start to come off. Hi! I love this project! I have everything to make it except the vinyl letters. I have searched on Etsy, but could you help me out with more specifics? It would be ideal for your cousin’s shop to be back, but if it isn’t, what size are those letters? I haven’t worked with letters on glass before, so could you direct me to an example of exactly the type of letters you used? (Maybe a link to something on Etsy?) I’m finding that there are upwards of 50 pages on letters, but between not loving the fonts and not knowing what I’m looking for (stickers? size? texture? ), I’m at a bit of a loss. Also, I’m not finding much at around the $2 mark, so I must be doing something wrong! 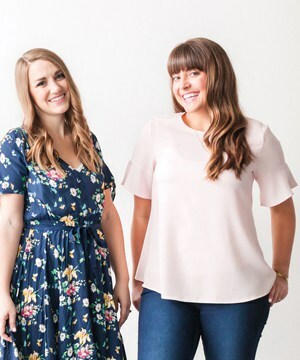 I need help finding the words on Etsy, help wanted. Great idea making some for my girls! What gold spray paint did you use? 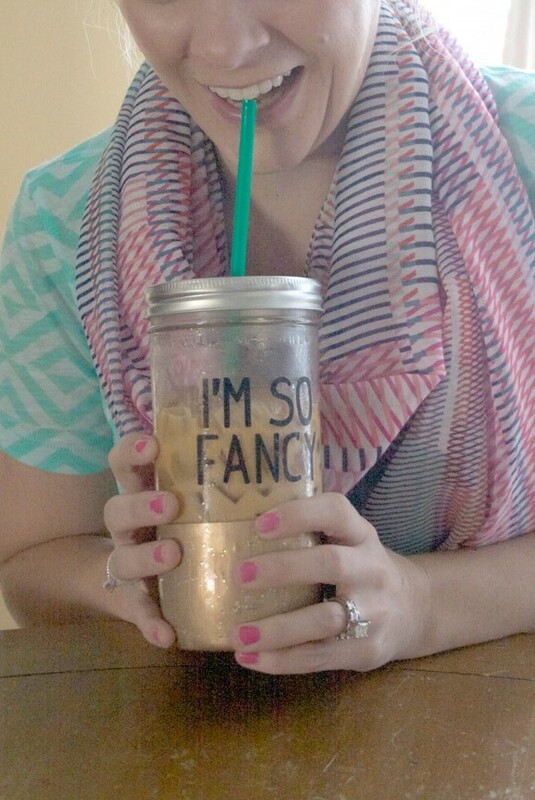 Has anyone figured out how to get the glitter on there without making the jar turn white when it’s cold? 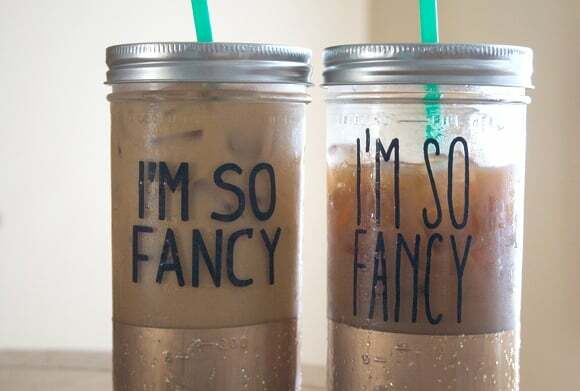 I saw these on Etsy, too, but I already have the tumbler and lid and was hoping to find a tutorial – thank you! What is the etsy shop called for the vinyl letters? oh YAY! so glad that you like them, I know your friends will LOVE them! Thanks!! Hope they love it! what size are the vinyl letters? Do you remember how many OZ your Mason jars were? Thanks! !